Adding a landscape feature with both natural stone and engineered pavers can give you the best of both worlds when it comes to hardscape. Deciding which type of stone to use for your next hardscape project can be a difficult. With a variety of natural stones and engineered pavers readily available, the paradox of choice threatens to make adding a new landscape feature a daunting task. If you’re having a tough time deciding which stone to use, we may just have the best answer for you – use both! A skilled Landscape Architect will be able to design a new hardscape feature that incorporates both natural stone and engineered pavers to ensure you get the benefits of both materials. If you’re looking to add a new driveway, and want the durability and easy maintenance of pavers, but the classic look of natural stone, you can line the new pavers with a cobble or granite edge. Another common combination consists of a durable paver patio, with the natural look of a fieldstone wall surrounding the patio or lining the property. Combining the two different types of hardscape materials requires a trained hand, as it is very easy to get carried away and end up with a hodge-podge of a landscape. 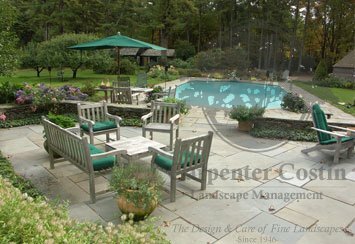 The proper balance of natural stone and engineered pavers, when coupled with a great planting design, can really make a synergized property. When adding any new landscape feature, it is wise to develop a landscape master plan so you can visualize the entire property, and plan to phase landscape projects that you would like to construct in the future. Take advantage of a free consultation to discuss how you can make natural stone and engineered pavers work for your property. Paver walkway and patio, paired with granite steps and retaining wall. Paver driveway lined with a cobble edge, and natural fieldstone wall. Natural stone walls are timeless additions to your property and serve as an attractive and functional boundary marker. For thousands of years, land owners have been using stone to construct the walls that lined their property; keeping their cattle in check, and helping to identify rigid property boundaries with their neighbors that could have lived many miles away. Though times have changed, natural stone is still a great choice for a wall surrounding your property. Years ago, farmers would save the stones they encountered when tilling their fields and use them to construct the long stone walls that marked their land. Luckily, stone is now readily available at a local hardscape distributor, which saves some excavation time and effort - but if you have existing stone on your property it can certainly be reused to help save costs! We’ve even constructed walls out of stone excavated from someone’s basement. There are many different varieties of natural stone, but for simplicity sake, let’s just focus on two styles: round stone and flat stone. Round stone presents a very organic and timeless look that meshes well with classic New England architecture. Flat stone is still very natural, but portrays a more elegant appeal that works well with both modern and classic architecture. Both styles of natural stone are beautiful and are sure to add a timeless appeal to your landscape. A natural stone wall is not only a great aesthetical feature, but it can also provide safety and security. We’ve seen a number of stone walls that have been damaged by cars that have strayed off the road. There is no telling where the car would have ended up had the walls not been there. Take advantage of our free consultations and discuss adding a natural stone wall to your property with a Landscape Architect. A small natural round fieldstone wall at the edge of a property, separating it from the street. This flat stone wall sits between a natural stone patio and a beautiful garden. Take advantage of existing stone on your property and create a new retaining wall. We always try to utilize existing materials when feasible, because it helps the homeowner save a few bucks and creates a cool story along the way. A recent project; however, involved using recycled stone from a very unlikely place – the homeowner’s basement. The homeowner was excavating an area in his basement, and transitioning it from a crawl space into a full-sized basement room. Little did he know, but he was going to find a tremendous amount of schist in his excavation that would make a great natural stone retaining wall just a few weeks later courtesy of one of our Landscape Architects. The wall, (pictured below) is made entirely from stone that was excavated out of the basement. Who knows, maybe you have some stone on your property that can be used to build a great hardscape feature of your own. Here are some before and after shots of the retaining wall. The area was overgrown and had an exisiting wall that was crumbling. The schist was perfect for this retaining wall. The wall was long, and the railroad ties weren't going to last much longer. All this schist was excavated from the homeowner's basement. Using recycled stone saved the homeowner a tremendous amount. The wall is ready for some new plantings and mulch!